Elasticsearch is a free, open source, distributed search engine based on Apache Lucene. Elasticsearch boasts being able to take the overwhelming complexity of Lucene and present it in a simple to use, cross-platform product providing communication through a REST API over HTTP. Elasticsearch integrates with various solutions to provide in-depth search, analysis and manipulation of data. 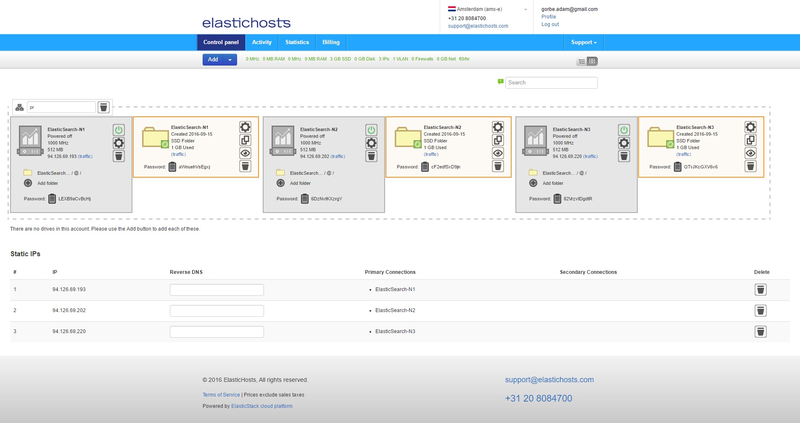 As a standalone server Elasticsearch will work well in smaller or development environments. For production environments however for improved stability, scalability and performance a cluster is very much recommended. As demand grows, adding additional servers is simple and straightforward. Before getting started, note that the resources used in this guide are vastly lower than those recommended by Elastic for running ElasticSearch in production. Although CPU is less of a concern for ElasticSearch, memory is very important; on production environments at least 8GB of RAM is recommended, preferably 16GB or even 32GB due to the potential workloads of the ElasticSearch cluster. Similarly, plenty of SSD or 15K drive storage is also recommended. As the following takes place in a lab environment, the cluster will see nothing near a workload requiring that amount of resource. 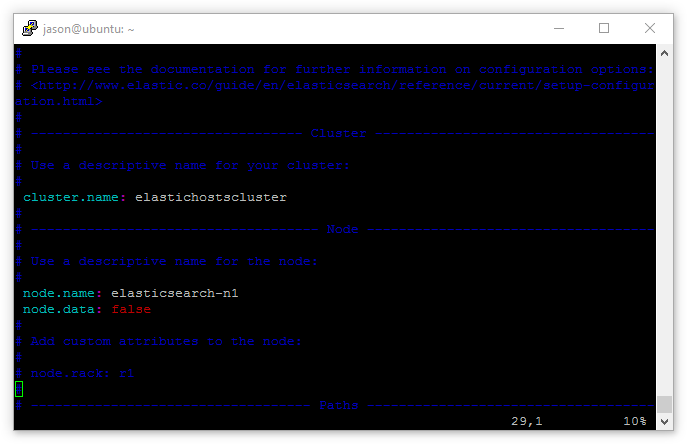 Before deploying a production cluster however, please read and follow the ElasticSearch minimum hardware guide here. For this guide, I’ll be using three Ubuntu 16.04 LTS servers in a master-data-data configuration. This type of setup scales well for performance, but it is not resilient to failure. In order to provide redundancy there should be at least two master servers; adding an additional master is documented at 5.4. The guide will equally work for 14.04 LTS and it doesn’t matter whether you use physical servers, VMs or containers, as long as they each have a dedicated IP address and can communicate on a private (v)LAN. 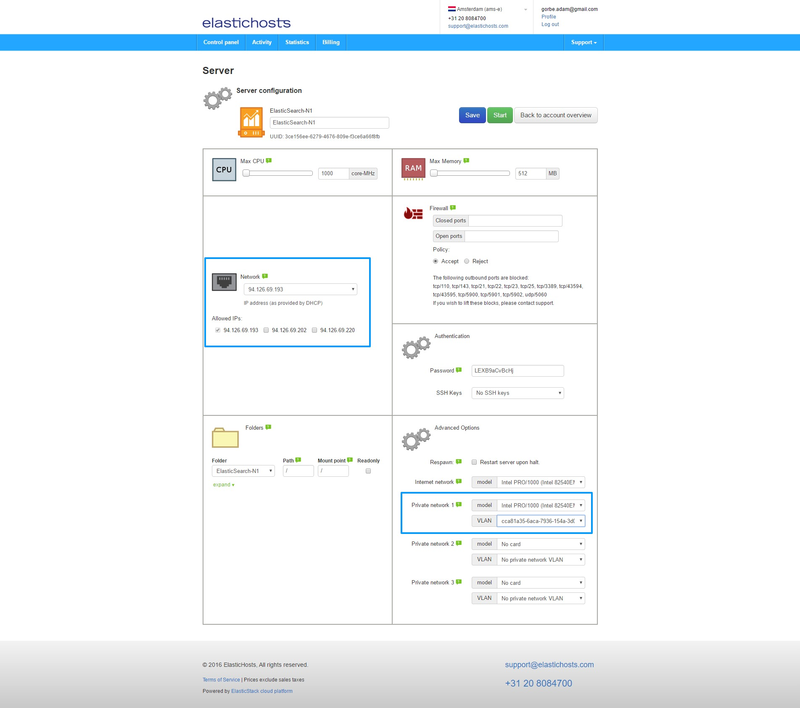 Hosted setup is demonstrated on ElasticHosts as they kindly provide me with a hosted environment with which to do guides on public infrastructure. If you have servers setup already with dedicated IPs and a private network, skip this step. Alternatively if you’d like to use LXD, skip to 3.4. below. From the ElasticHosts admin console, create three new containers: ElasticSearch-N1, ElasticSearch-N2 and ElasticSearch-N3. To do so, click Add then Server under Linux Containers. Next, create 3 static IP addresses to avoid DNS issues should the containers get rebooted and acquire different IP addresses from the DHCP pool. From Add select Static IP. Do this 3 times to get 3 addresses. Static IP addresses are listed at the bottom of the admin console. To allow the containers to easily communicate internally we can also create a private VLAN by clicking Add and selecting Private VLAN. Finally, before starting the containers for the first time, assign the IPs and VLAN to the containers. If we were just to edit the IP we could click Dynamic IP on the container in order to select any available IP, but as we’re also assigning a VLAN we need to click the cog icon to enter the server settings. As highlighted in blue, select a newly created IP on the upper left, and assign the VLAN to an Intel PRO/1000 NIC on the lower right. Do this for all three containers and we’ll end up with them bundled together under the VLAN, each with their own static IP. At this point in time this is only dealing with the one NIC, the second internal IP will be configured shortly. All three containers can now be started. Skip LXD setup below and move on to server configuration and installation of ElasticSearch. If you have servers setup already with dedicated IPs and a private network, skip this step. 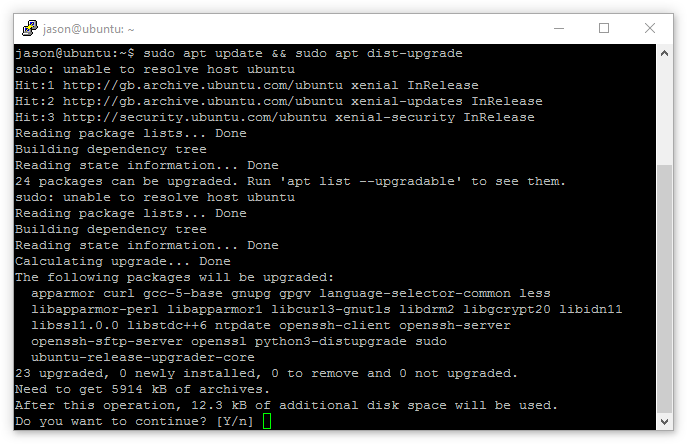 If you haven’t yet set up LXD, follow my guide. By default LXD will either supply IP addresses via its own lxdbr0 bridge, or alternatively can be configured to receive them from the LAN DHCP server; in these cases to keep the Elasticsearch servers private, simply don’t NAT to them from the external firewall or configure forwarding via iptables on the LXD host. If LXD is configured in such a way that all containers have a public IP address, continue to 3.3.1. once the containers are created. This will create the containers from the Ubuntu image repository, where :x stands for Xenial (16.04). If the containers will require a VLAN, use init instead of launch so that the containers will not automatically start just yet. When complete, Ctrl + X to save, then Y to apply. The following steps will need to be undertaken on all three containers except where stated. Furthermore, consider switching from password to key authentication as soon as possible. LXD containers are key-authenticated by default. NB: All commands below this alert will be targeted towards a non-root sudo user account. Earlier all three containers were added to a private VLAN, now it can be set up. PING 10.11.12.11 (10.11.12.11) 56(84) bytes of data. Elasticsearch requires the latest version of Java. 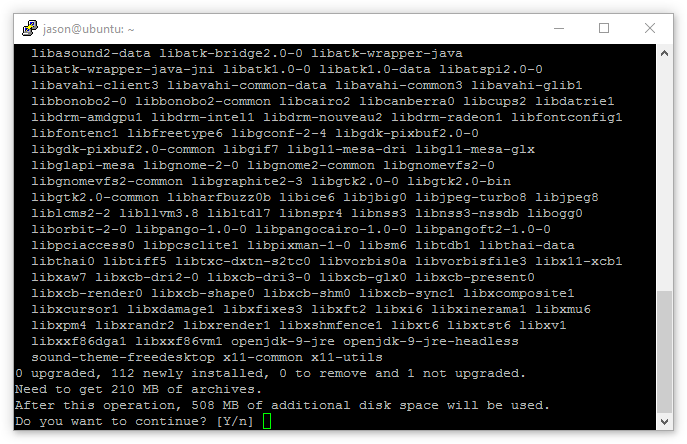 For LXD I had issues with OpenJDK, so recommend the official Oracle Java package documented further down. NB: You need only to install one of the below Java packages, not both. The latest version of OpenJDK JRE is 9 and as Elastic recommends the latest version, that’s what will be installed. Note: As shown in the screenshot below, Java and its dependencies can consume a lot of space. The installation will take a while. NB: There is no need to do anything more with Java. Although there are many, many configuration options available for the Java VM, it’s advised by Elastic to not make any changes as this can negatively impact Elasticsearch. 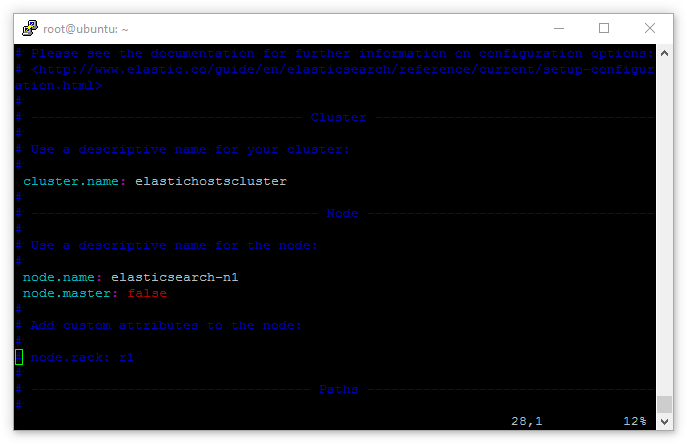 With Java installed let’s now begin the installation of Elasticsearch. For this guide the repository method will be used as this will allow easier upgrades across point versions (though will need to be edited for major releases, explained below). Looking at the command above, Elastic explicitly state 2.x in their sources list. To avoid issues cross-installing packages of different versions they chose to separate their sources lists into a list for each major version. This means when version 5 is released later, the newly-configured apt list at /etc/apt/sources.list.d/elasticsearch-2.x.list will need to be updated. Naturally node.name: needs to be different for all 3 servers. Notice also the additional line node.data: false – this is used on the master server as it doesn’t need to store data with two data nodes already doing so. Now the servers know where they stand as masters and data nodes, let’s make it as easy as possible for them to run initial discovery. It’s possible for the master and data nodes to find each other, but on unicast networks (and the fact there are really no network services on the eth1 private range) there’s no harm in giving the servers a hand. 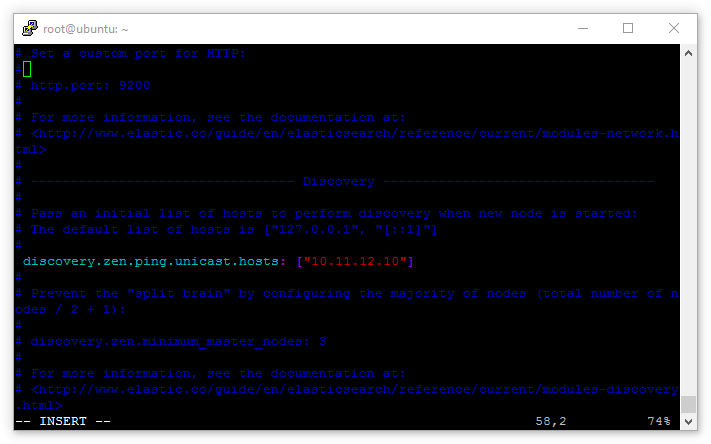 Find the entry: discovery.zen.ping.unicast.hosts: ["host1", "host2"] and uncomment it. Finally let’s lock the Elasticsearch cluster down to only allow requests from the private IP range, this will ensure only servers explicitly granted access to the private network can interact with the Elasticsearch API. This will prevent the cluster from receiving requests outside of the private IP range, but as it’s being locked it down to one interface, the _local_ entry allows the servers to retain access to loopback. Naturally, the cluster being locked down in this way means any servers that should be able to talk to the Elasticsearch cluster must also be on the private IP range, either as a member of the VLAN or through a VPN. The latter requiring the setup of a VPN server which isn’t in scope for this guide. Success! All three servers are clustered properly and working together. Without an index there’s nowhere for Elasticsearch to store data. It’s easy to create as many indices as required; if the contents of 1,000 websites needed to be indexed for example, 1,000 indices can be created and interrogated as individual data sources without ever worrying about mixing that data up. This tells us there are two indices, and as replication is already set up and configured by creating the cluster the health status is green. restart the Elasticsearch service on all nodes. After restarting the Elasticsearch service it will be ready to go. With the vertical auto-scaling capability of containers as well, the cluster can handle more complex queries without having to create new servers vs traditional VPS instances. To add redundancy to an Elasticsearch cluster – that is if one master fails the cluster will continue to function – adding additional master nodes is both quick and easy. Why three masters? When considering redundancy, if there were two masters and one failed the setting above would result in the cluster failing; it requires at least two masters to be present and in the case of a single master failure this would not be the case. With three masters should one fail there will still be two, enough for Elasticsearch to run as a cluster without the fear of the split-brain issue cropping up. So there we have it; an Elasticsearch cluster running across three Ubuntu 16.04 servers all working together in unison. For every query made against the indices, the same results are returned on all three servers. Magical! Following this guide you should have spun up three Ubuntu containers, installed Java, installed and configured Elasticsearch and proven it’s working as intended. Naturally what we’ve done today doesn’t even scratch the surface of the capabilities of this software, Elasticsearch is so versatile and has so many uses that many can’t even explain exactly what it is and does! If you’ve set up Elasticsearch for your own test or production environments, feel free to let me know what you’re doing with it in the comments.